Ok, I've seen a bunch of stuff today that doesn't necessarily deserve it's own blog post, but the combination of all of these things, certainly deserves a blog post. These are things that made me say yay today! Peter Capaldi, Peter Capaldi, Peter Capaldi. Some folks may not know why people are so excited about Capaldi as 'Doctor Who,' but Capaldi has been a longtime character actor and he's a huge 'Doctor Who' fan. He's quite popular in some circles and there's nothing better than a true 'Doctor Who' fan, playing 'Doctor Who.' This is always a plus. Today BBC explained why Capalid is really the doctor! Children love 'Doctor Who' and Capaldi is no exception. Capaldi took a break from filming Season 8 to talk to two little girls, who were unconvinced that he would be a good Doctor. Needless to say, I think Capaldi can win them over. Cosmos is back for a new generation in 2014. Cosmos debuted in 1980 with the first images of the Voyager spacecraft flying past Saturn and its moons. Cosmos was a landmark 13-episode series about the laws of nature, space, and time, hosted by brilliant astronomer Carl Sagan. I've been watching the old episodes on the National Geographic Channel, but I was but a wee toddler when the show debuted so I don't remember it. I am a very late Gen Xer or an early Gen Yer. Likewise, if you're a Millennial then you may not be familiar with this show, but it's super cool. As a Sci-Fi fan, I like both sciency and philosophical stuff. 'Cosmos' has all of that! Renowned photographer Annie Leibovitz captures the cast of 'Game of Thrones' and the pictures are of course beautiful. You can see the video of the behind the scenes photo shoot here. The April edition of Vanity Fair will hit stands on March 13th. 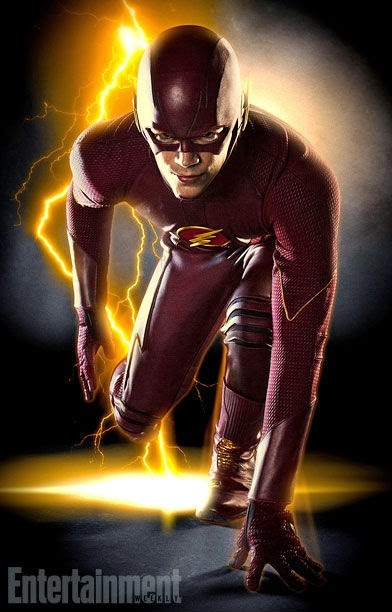 We have our first full body shot of The Flash's costume from the new television series. Yeah, ok it's cool and all, but what about 'Wonder Woman?' I'm going to boycott and possibly riot until I see 'Wonder Woman' on screen...now! Buzzfeed has yet another fun, yet useless post about what superhero are you? 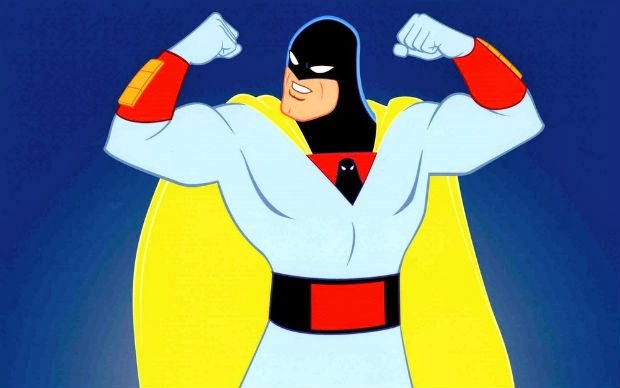 I got...'Space Ghost.' Ok, but couldn't I haven't gotten a DC Comics or Marvel character? Hanna Barbera, Seriously. Supposedly, I fit the following description. If so, I'm scary. "You are only the king of space. What else do they do they want from you? You’ve given America, nay, the world, your crime fighting powers by day and your critically acclaimed talk show host powers by night, and shouldn’t that be enough? You also have an evil twin brother named Tad Ghostal, but this personality description isn’t about him, it’s about you, so stop thinking about Tad, right now. Stop it." Lena Dunham may quit acting after 'Girls.' I will say that there's way too much naked time on 'Girls.' Her stint on 'Saturday Night Live' touched on that. I know that there are some folks who will be happy about this fact, so I feel inclined to post it. I'm not trying to be mean to those who are fans of hers. And in other news today, a man called 911 after his 22-pound cat attacked him and his seven-month old baby. 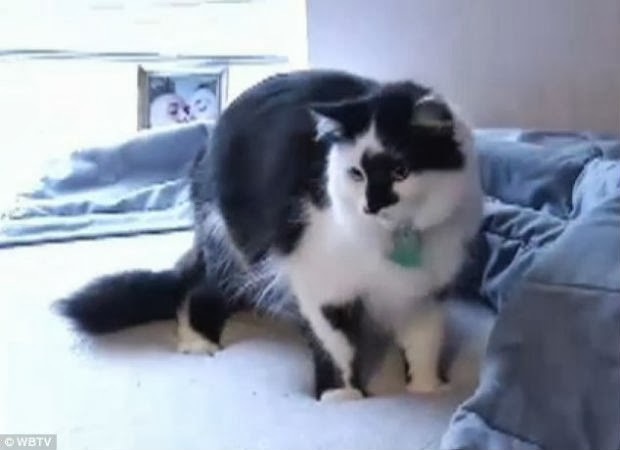 Supposedly, the cat held him hostage in his bedroom until police arrived. I have two cats. I have the scars to prove it, but I don't think I've ever come across a cat (excluding a bob cat) that a good ole' fashioned water bottle couldn't fix. Dude, a twenty-two pound cat? 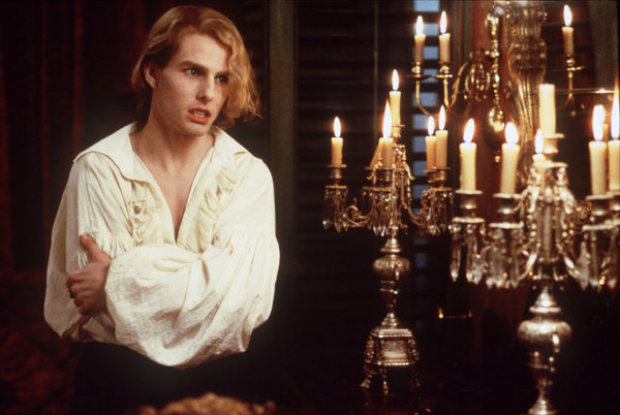 You lost all your man points. Not a Hunger Games fan, so the Honest Trailer rocks. 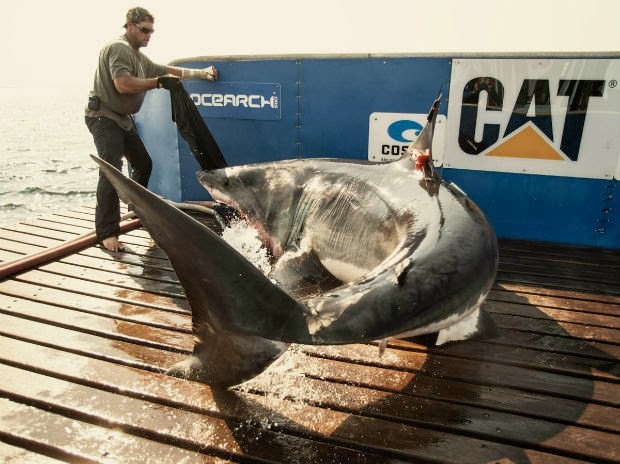 And no way am I standing on a deck with a great white shark! Alex-- You always make me laugh! Yes, you're right about that. I didn't want to say that he had lost his man card, but you are quite right. A 22-lb cat should not hold you hostage in your own home. Already love Peter Capaldi! He is embodying what Doctor Who is, a Kids show! David-- That's exactly right. Doctor Who is a kids show. Sometimes people forget that! 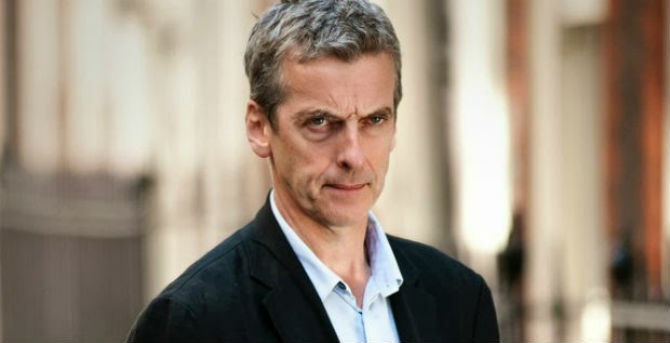 I can't wait until August with Peter Capaldi as the new doctor. I really need to catch up on that series! 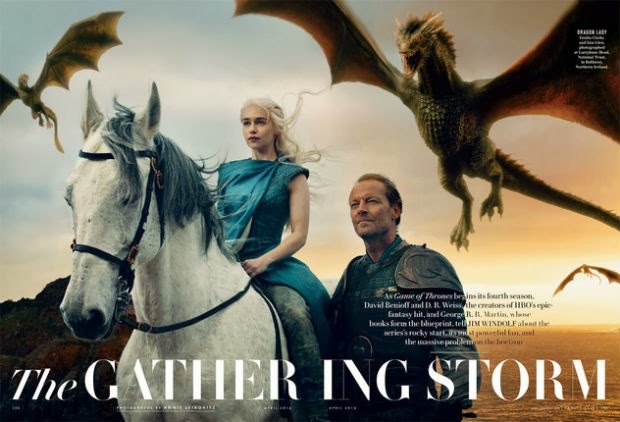 Leibovitz really nailed it with the Game of Thrones photoshoot. Wonder Woman needs her own series - though I love the original, it could easily be updated technology-wise. What an amazing reboot it could have! Me too! I'm super excited about Capaldi. I'm a little nervous that he won't be the doctor for long. There are rumors he only signed for one season. The GoTs photos were so gorgeous. I'm so ready for a WW film. 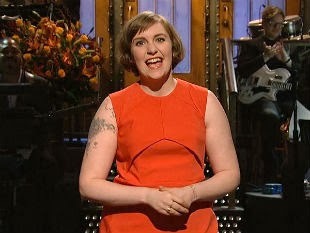 Lena Dunham will be gone from screen?! HALLELUJAH! !